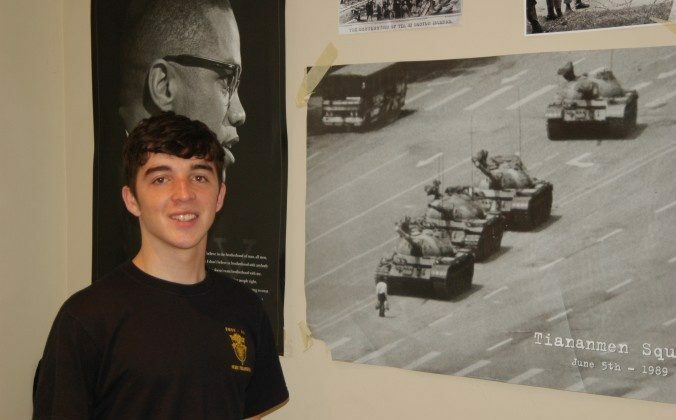 Henry DeGroot, an 18-year-old senior at Newton North High School in Massachusetts, experienced at a personal level what he described as American appeasement of Chinese officials. “Yeah, there’s definitely somewhat of an appeasement of Chinese officials, like a sacrifice of people’s values and ideologies …” He expected his school to support his freedom of expression, but it did not. DeGroot recently returned from an exchange program at the Beijing-Jingshan School where he expressed his pro-democracy viewpoint by writing a note in English in a Chinese student’s notebook. He recalled writing “Democracy is for cool kids,” and “Don’t believe the lies your school and government tell you.” Jingshan school officials saw his note and sent him to detention, but allowed him to stay and finish the semester abroad. The Newton North High School administration banned him from attending his senior prom. He had hoped his American school would support freedom of speech. DeGroot said his school counselor and housemaster first banned him from the prom. He appealed to the principal. He was surprised when Principal Jennifer Price did not overturn the decision. DeGroot speculated that because Price must maintain a relationship with the Chinese school administration, she had to show that she didn’t support his actions. Before leaving for the program, DeGroot signed an agreement promising to be on his best behavior. He said he believes that what he did was not disrespectful, by American standards. He thought the program coordinators and school administration violated their part of the agreement. Living in Beijing for four months, DeGroot witnessed several aspects of political corruption. Many times the pollution index was above the limit at which the school should have been closed. However, the government reported falsified numbers that were under the acceptable limit. For example, “Right, so for a week they were reporting 480, and the cutoff to close off schools is at 500 and the American Embassy was reporting 540.” The school stayed open. His peers had polarized opinions about the situation. Most supported him, but others disagreed with how he handled things. “First of all I definitely support people criticizing me, I think that what I did was stupid, like I could’ve done it in a better way.” Degroot wrote an apology, at his school’s request. However, some criticisms were personal attacks, such as one from one of his Chinese classmates, who he described as a “Maoist apologist,” who recently emigrated from China. DeGroot said he did not understand how the portrait of Mao, “a mass murderer” could still hang in Tiananmen Square. A call to Newton North High School has not yet been returned.